With no warning, the mischief is suddenly reduced to two members. I came downstairs the other morning to find that Yori had died unexpectedly overnight; she had been perfectly happy the previous evening and hadn’t even had so much as a sniffle for weeks. The smallest rat had been a bit of a medical mystery in her short life. Last August we had the unexplainable “bleeding from the eye” incident. And then earlier this year she was bleeding again, different location, which led to her being spayed (although the vet couldn’t see anything obviously wrong with her when she operated). Apart from the random bleeding and the initial respiratory infection when she joined us, she had always seemed to be a remarkably healthy and energetic little ratty, and even when there was something wrong it didn’t slow her down at all (even continuing to run in the wheel while bleeding). She was always the first to the cage door and was the most active one in the evenings, still running around while the others had found comfy spots to curl up. Any squeaking was usually caused by her deciding to exert her presumed authority by power grooming the others; she was utterly convinced that she was the alpha of the group. Yori was a real ratty ambassador, cute, licky and loved by all who met her. I will miss having her on my lap at snack time, making sure she eats hers rather than hiding it. Ratties can be such a source of stress when they’re not well. I went to give the ratties a snack this morning and when Yori took hers I saw her right eye was covered in blood – it must have literally just started then, because there was none anywhere else. I called the vet, got her into the carrier and dashed off to Streatham Hill. She cleaned the eye while she was in the carrier and there was no obvious injury at all, but the blood just kept welling up from around the eyeball. The vet kept her in and examined her under anaesthetic and there is no visible source of the blood. Apparently the bleeding has stopped now and if she’s still okay in a couple of hours she can come home. I now realise that this has happened before, a couple of months ago. One morning I came down and there was a little more pink around than usual, but they all seemed healthy and there was nothing to concern me. Of course, when I did a cage clean a few days later, that was when I found the minor bloodbath in the hidden places in the cage. But everyone was fine and no signs of any problems since. Presumably she has a weak blood vessel or something like that behind her eye that gives way every now and again. My vets are pretty good with the rats, but this is beyond their expertise. They’re going to speak to some specialist exotics vets on Monday to get an opinion, but, being realistic, I can’t imagine that much could be done, even if an ultrasound did identify the cause of the problem. 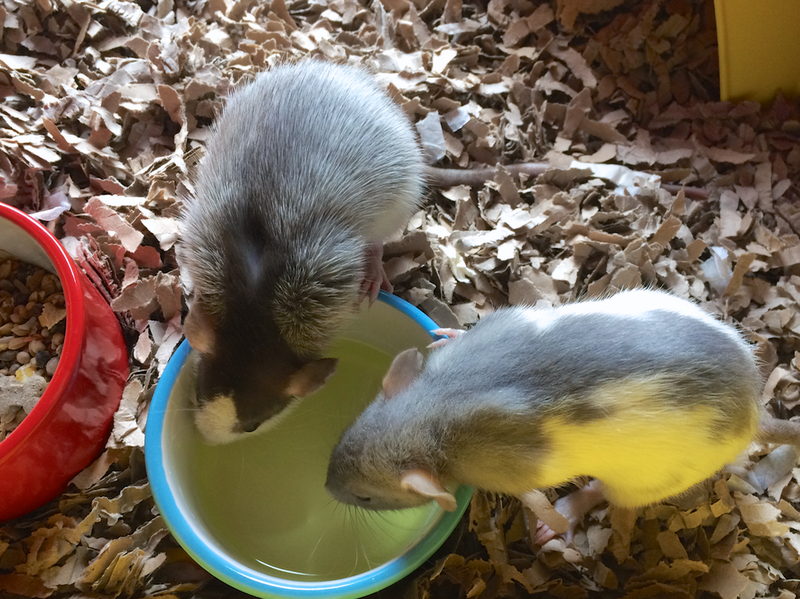 Little ratty heads are very little and Yori is the smallest ratty I have. I was a bit premature in announcing how well Midge was settling in. There had been a few squabbles the first week she was here, though all the ones I’d seen were the result of Quorra being over-enthusiastic with grooming the newcomer. And even then it was no worse than a bit of squeaking, pinning and fluffing up. Midge had two deep scratches on either side of her ribs, one of which was full thickness through the skin. Yori had a damaged claw (which she lost that evening, cue more blood). Rocket had a couple of nasty looking puncture wounds around her shoulder. Quorra and Rommie were completely untouched. I have no idea what went on — the injured ratties hadn’t shown any signs of scrapping with each other in the previous week or so. And everyone was quiet and settled by the time I went to do the breakfast snack run, even though the blood was very fresh so it can’t have been long since whatever happened happened. I took Midge over to the vets to get checked out and came away with some Baytril for her and Rocket and some hibiscrub to keep everyone’s wounds clean while they healed. Luckily rats heal remarkably quickly. To the extent that, the following morning, I couldn’t even find the spots where Rocket had been spiked — so I just generally wet her shoulder and surrounding area with the hibiscrub; she was not impressed. Midge’s wounds scabbed up quickly too, but I kept her separate from the others to avoid both excessive grooming and further scraps. Our lot have settled back down into their old ways and seem a lot more relaxed. And I don’t have to worry about trying to figure out ratty psychology. It’s a shame it didn’t work out, but at least everyone is happy where they are. 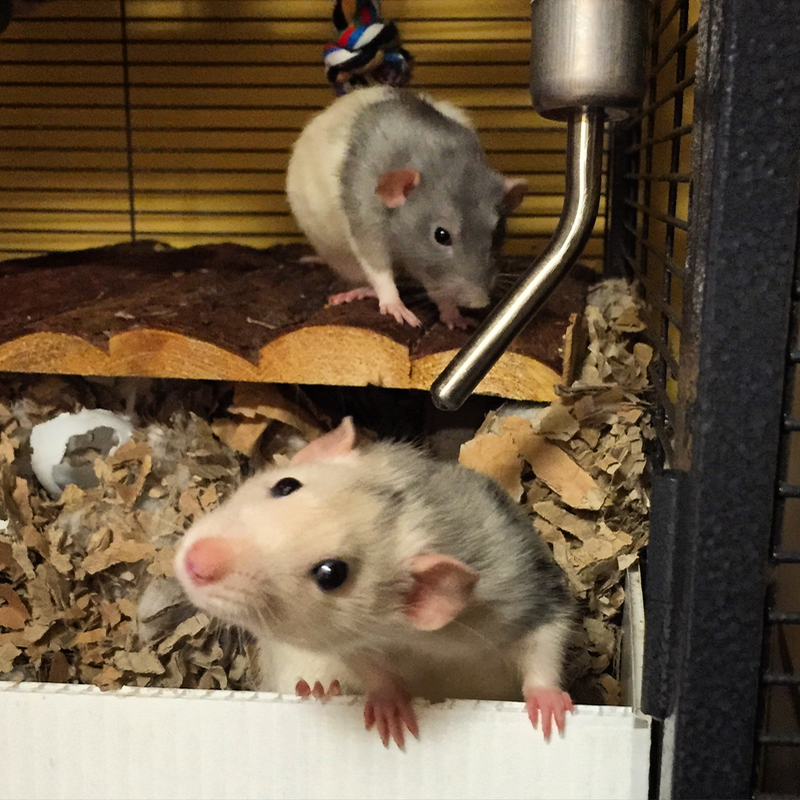 We were going to wait until the end of October last year — when Rocket and Rommie would turn one — before getting more rats, but then some became available at the end of September and little ratties are so cute that, once seen, they just cannot be left behind. Yori is a tiny grey hooded dumbo. Her fur is very slightly longer than the others, which means that, no matter how much she grooms herself, she always looks like she’s been dragged through a hedge backwards. She came down with a respiratory infection soon after we got her home; luckily it was nothing worse than a lot of sneezing, but it did mean she didn’t put on weight as quickly as her sister. At nearly nine months old, she is still small enough to comfortably sit on the palm of my hand. Even though she is the smallest ratty, she is convinced she should be the boss of the cage: she always has one or two little scratches where one of the others has got truly fed up with her following them around the cage, indulging in power grooming and inappropriate sniffing. She is the lickiest rat we have ever had, by far, and will happily sit and lick her way over your hand given the chance. She is also a little horror for hiding food. When I feed them she goes around picking up anything the size of a pea or bigger and systematically carrying it off into the hammock or hut to “hide” it. This doesn’t fool anyone. I wouldn’t mind so much if she was storing it to eat later, but that doesn’t appear to be the case. Quorra is a roan dumbo. Roans are the con artists of ratty colouring: when we got her she was a lovely dark grey with an unusual black patch across the back of her neck, now she is mostly white with a few darker bits scattered around. At the end of January, she developed a bit of a head tilt. A course of steroids and antibiotic injections seemed to sort out the underlying ear infection, though she has been left with a permanently skewed outlook (which is utterly endearing). The twisty head has given her superpowers. She can rotate her way out on to the top of the cage, or down into a t-shirt, with remarkable speed and ease. Although she does sometimes forget to check whether there is actually any ground underneath where she’s heading, the tilt has really not slowed her down at all. Quorra loves the “disappearing down a t-shirt” trick. I let her get away with it because it is just so adorable when she spins round and pops her tilty little head out the top and stares at you (it helps that she is neither the heaviest nor spikiest rat). She also loves drinking from people’s cups of tea. And then splashing around in them. Where Yori is licky, Quorra is kissy. Many times when she pops out of the top of my t-shirt, she follows it up with a face or lip lick as I look down at her. This is cute. Not so cute is when she decides that she must investigate further and tries to pull my lip out of the way with her pointy little ratty claws; this behaviour is not encouraged. Together they are a wonderfully entertaining addition to the madhouse.